The Whisper 500 is a 3000-watt rated turbine that will deliver in excess of 500 kWh per month in a 12 mph wind. This machine has a 14-foot, 2 blade rotor providing 500 sq. ft. of swept area. It features a handmade fiberglass and foam core blade for smooth, high efficiency operation and low wind start-up. It also incorporates the patented “angle governor” design for quiet operation in high winds. The 500 is an excellent machine for village power projects, farms, ranches, backup power and remote homes with large energy demands. The Whisper 500 comes in two boxes and is shipped truck freight. 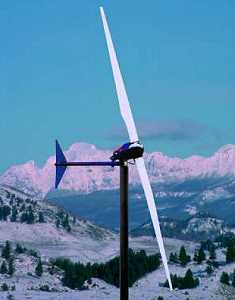 By changing the furling angle upwards now more force from wind is required to furl the turbine. This leads to less number of furling actions and now the unit furls at 12m/s or above, previously the unit would furl at 10m/s. 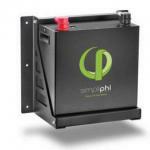 This creates more power and less mechanical stress on the unit. The alternator windings including the stator core and the rotor can at peak power can provide more than 3.5 KW output compared to the 2.8 KW output of the previous model. After redesigning the stator winding peak temperature is now only 55oC compared to previous version which had temperature of 110oC. The units now have “H” class insulation which can withstand up to 180oC compared to the "F" class previously used by SWWP which was only rated to 150 oC This reduction in temperature generated and higher temp rating of insulation reduces failure due to a short circuit. The winding coils in Whisper 500 are impregnated with varnish in a vacuum furnace. The coils /winding are therefore impervious to atmospheric conditions such as water and other elements through its life time. 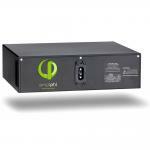 The Whisper 500 is available in 24-volt and 48-volt DC versions as well as 120 and 240 VAC versions.